Matt Moore knows a thing or two about first impressions. A September call-up in 2011, Moore's second major league start came in the first game of the 2011 ALDS. Against the heavy-hitting Rangers, the Rays pitcher threw masterful two-hit ball over seven innings. It was a star-making performance that made him one of the most heavily hyped rookies of 2012. And while Moore was solid in his first full season with Tampa Bay, it didn't generate the same level of excitement as the playoffs. Combine that with the emergence of Bryce Harper, Mike Trout and others and Moore fell a little bit off the hobby radar. 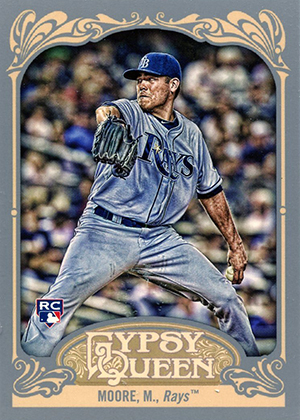 But now that Moore seems to have his masterful stuff back, collectors are giving Matt Moore cards a second look. Get deals on Matt Moore cards on eBay. Matt Moore rookie cards are found in 2012 products. While most can be found for a few dollars or less, there are a couple of exceptions. Top choices include 2012 Topps Triple Threads and 2012 Panini National Treasures. Both are numbered to 99 and come with both autographs and jersey swatches. Moore has lots of autographed inserts from 2012 products as well, particularly in Topps sets. While these 2012 Matt Moore cards are gaining popularity, they're not necessarily his best cards. His first autograph card can be traced back to 2010 Donruss Elite Extra Edition. 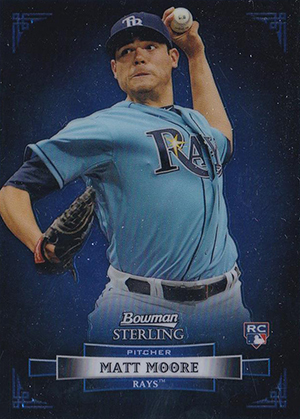 His first cards in a Rays uniform are 2009 Bowman, Bowman Chrome and Bowman Sterling. 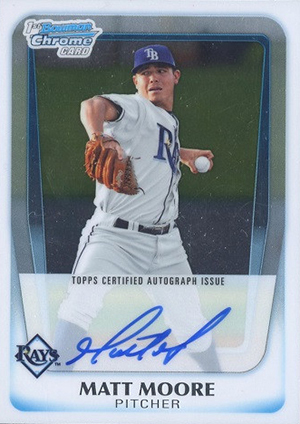 However, the most popular of all Matt Moore cards is his 2011 Bowman Chrome autograph. Like any young pitcher, Matt Moore cards carry something of a risk. A couple of poor seasons or one injury could kill a lot of momentum they build with collectors. At this point, though, the risk is somewhat minimal. Other than a couple of exceptions, his cards remain relatively inexpensive. 2009 BOWMAN CHROME MATT MOORE RC GOLD REFRACTOR SF GIANTS #35 50 BGS 10! POP 1! Below you will find an example of what Matt Moore's authentic signature looks like. This can be used as a first point of reference for determining the legitimacy of autograph memorabilia, but is not a substitute for having your items authenticated by a well-respected professional autograph authentication company.